Ever look at a product and instantly feel that you can get a better deal on it somewhere else? Well, chances are you’re probably right. To save you the hassle of driving to local stores or aimlessly searching the web for the lowest prices, we’ve built the ScanLife mobile app. ScanLife is a shopping companion that will let you quickly find the best prices this Black Friday and holiday shopping season. With a simple scan of a product barcode, you’ll unlock low prices available to you locally and online. As you head out for Black Friday, it’s important to keep in mind that not every deal advertised is actually all that great. Retailers may be promising you a huge discount, but the product could be available for much less elsewhere. So before finalizing any purchases, it’s imperative to compare prices. It takes just a few seconds to scan the item to make sure that this is in fact a great deal. You could make a discovery that saves you good money. It gets even better than just saving money. Now that you’ve found a lower price, you might not even have to drive down the street to get the item or wait for it to be shipped to your home. 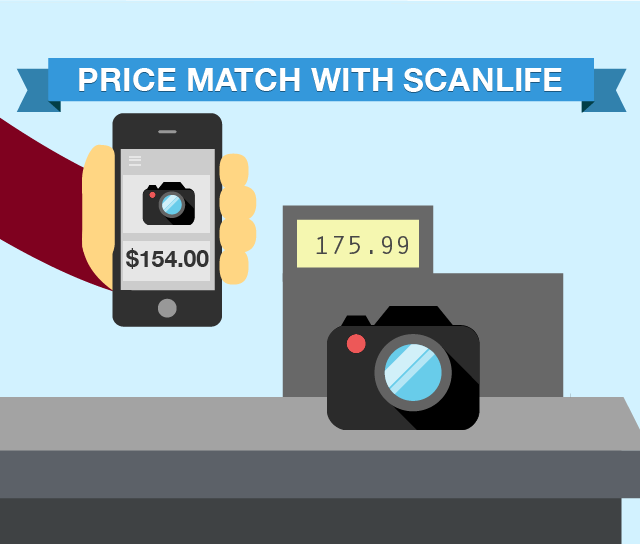 Some of the nation’s top retailers have price matching policies, which means they will match the lower price that ScanLife found for the same product. Walmart, Best Buy, Target, Toys “R” Us, Home Depot, Lowe’s, DSW, Bed Bath and Beyond, Staples, and Sears are a few that honor competitor prices found online. Please refer to the retailer’s official website for detailed price match policies or simply ask a sales associate. Good luck with your bargain shopping! And more importantly Happy Thanksgiving from your friends at Scanbuy.